Glaciers do more than feed our rivers and lakes, they also serve as critical savings banks for water withdrawals when other sources dry up. In South America, the glaciers and snowpack that crown the Andes provide slow, consistent meltwater that acts as a buffering mechanism during dry summer months and drought periods for many cities. La Paz, a metropolitan area of 2.3 million, for example, relies on glaciers for 15 percent of its water on average; however, during dry months, this number bumps up to 61 percent, and during the driest month of a drought year, it rises to 85 percent. This urban water buffer is expected to become even more critical as higher temperatures dry out local farms, lakes and ecosystems, and contribute to more frequent and intense droughts. But therein lies the rub: Tropical Andean glaciers have shrunk 30 to 50 percent in the last 30 years, and many small glaciers may disappear altogether in the next decade. To ensure they can thrive in a climate change future, cities are fighting back. As glaciers retreat, water-stressed cities across the Andes are boosting their resilience by developing innovative and cross-sectoral solutions, investing in green infrastructure, employing smarter water management, and improved data and decision-making processes. Here are four Andean cities coping with glacial loss and the implications for water security and development. In 2016, Bolivia was gripped by the worst drought in 25 years. The government declared a state of emergency. Some neighborhoods of La Paz and its twin city El Alto received water for only three hours every three days; others received none at all. Local schools were forced to close for summer break two weeks early, and hospitals worked at just half capacity. A “Water General” was put in charge of distribution efforts. Scientists are pointing to rapid glacier retreat, booming urban migration, rising temperatures and a particularly strong El Niño event as the major culprits that brought the metropolitan area to the brink. 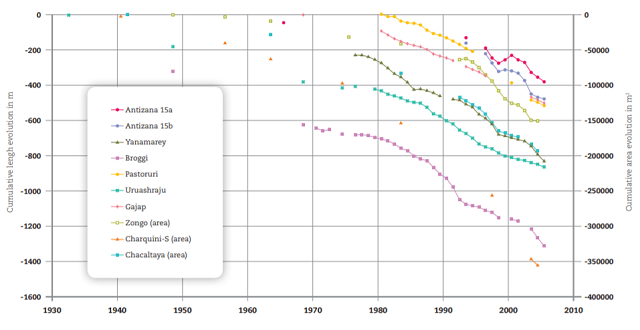 Between 1986 and 2014, glaciers in the Bolivian Andes shrunk by 43 percent, or about 88 square miles. La Paz’s iconic Chacaltaya glacier, former home of the world’s highest ski resort, completely disappeared in 2009. Still, Bolivia has a vision for a secure water future – the government recognized access to water as a constitutional human right in 2009, and the its National Agenda 2025 seeks to ensure universal access to clean water. International aid is trickling in to support infrastructure transformation (an audit found that 45 percent of La Paz’s water is lost through leaks) and boost urban resilience. The Inter-American Development Bank and South Korean government recently granted $75 million in loans for new urban water infrastructure. La Paz is also a featured city in the World Bank’s $33.6-million project on glacier retreat in the tropical Andes that includes water transportation efficiency and expanding research and monitoring. Local environmental groups also argue that water usage and contamination by industry, mining and large-scale agriculture must be addressed to realize water security. The next drought will put these efforts and commitments to the test. 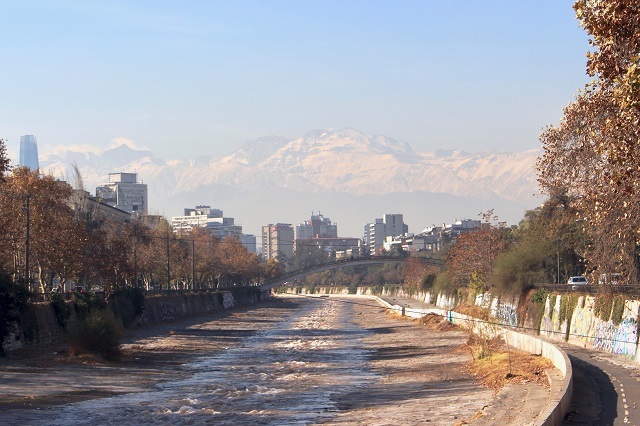 Santiago’s reliance on glacial melt as a buffer during hard times is less certain than La Paz’s, but some estimates suggest the city relies on glaciers for up to two thirds of water use during the driest months of a drought year. Santiago’s winter rains arrived almost two months late this year, making it one of the driest years in half a century for the 7.2 million people that reside in the mountain-side metropolis. In light of growing drought concerns, the city water utility, Aguas Andinas, has invested almost $24 million in eight new water storage tanks. Santiago city planners are the first to admit that new water reservoirs are a band-aid solution to long-term climatic changes. The Nature Conservancy found that by 2070, Santiago’s primary water source, the Maipo River, may face a 40 percent reduction in water availability due to glacier retreat and lower precipitation resulting from climate change. The Maipo is fed by more than 1,000 glaciers that cover almost 400 square kilometers and trickle down through high-altitude wetlands into municipal catchments, groundwater reserves and agricultural irrigation systems. Like the vast majority of Chile’s glaciers, most of these source glaciers are disappearing. The Nature Conservancy Chile is teaming up with Aguas Andinas, local government, and the mining organization, Valor Minera, to protect and restore the Maipo’s upper-watershed areas, allowing them to better absorb and store dwindling glacial melt. They convened a group of public, private and non-profit stakeholders in January 2018 to sign onto the initiative and collaborate for a six-month planning phase. Quito’s Climate Change Strategy estimates the city relies on glacial contributions for 35 percent of its water supply during the dry season. To ease its reliance on glacial runoff and lower water demand, the city is creating new “eco-neighborhoods” designed with grey water recycling and other water saving techniques. A city glacier monitoring and watershed modeling initiative is currently underway to help understand the delicate relationship between glacial melt, municipal water supply and páramos – alpine wetlands that “act as natural sponges…storing, filtering and gradually releasing large amounts of water.” A Nature Conservancy-designed water fund is compensating upstream land owners to help preserve the city’s watershed. A Nature Conservancy-led water fund, AQUAFONDO, is collaborating with SEDAPAL to preserve upstream watersheds to help counteract the declining flow of glacial melt. The city now depends primarily on rainfall, which may become more uncertain as climate change progresses. Cities and researchers are just beginning to understand the extent to which glacier retreat threatens the livelihoods of communities in the Andes, the Himalayas and beyond. Adding to water risk, hydropower is often a major electricity source; water-intensive mining operations are a core pillar of the economy; and irrigation systems support intensive crop production in semi-arid, mountainous regions. The interdependence of water, food and energy systems in the Andes, especially, means that climate change and water scarcity may amplify existing inequality and inhibit development. As more mountain municipalities create adaptation and resilience plans, there is much to be learned from these Andean cities about inclusive and innovative planning. With proper leadership, collaboration and forethought, we can work to mitigate the loss of the world’s glacial savings accounts and continue making progress towards cities for all. Kate Cullen is a Fulbright Student Scholar researching glaciers and water security in Chile and former WRI Brasil intern.